Parmesan chiffon cake - light and airy chiffon cake with a tint of Parmesan cheese, and topped with shredded Parmesan. Amazing recipe that you have to try. I am sure many of you have missed my baking contributor CP Choong, who famously created massive social media frenzy with her amazing Nutella Cheesecake (shared over 350,000 times on Facebook and going!) and Brownie Butter Cake (pinned almost 200,000 times). She took a break from baking for a few months and now she is back. She is an amazing baker who can whip up all kinds of cheesecake and with the festive season of Thanksgiving and the holidays coming up, I asked her to share a few cheesecake recipes with us. Let’s start with this amazing Parmesan Chiffon Cake, a recipe she tried from Nasi Lemak Lover (an amazing food blogger and baker from Malaysia, do check out her blog). This Parmesan chiffon cake has a very light, feathery sponge cake texture with just a subtle cheesy flavor and aroma from Parmesan cheese. The taste of the Parmesan cheese is just right, not overly cheesy. To jazz up the presentation of the cake, CP coated butter cream all over the top of the Parmesan cheesecake and then sprinkled with shredded Cheddar cheese. The savory cheese topping makes the whole cake more dimensional in taste, combining savory and sweet together. Look at the pictures, isn’t it beautiful? You can also be creative and play around with toppings: fruit compote, jam or preserves, etc. If you don’t have the chiffon cake tube pan, you can use normal round pan (not too big, recommended 7″ or 8″) to maintain the height. If you haven’t tried Asian-style Chiffon cake, you should totally try this Parmesan chiffon cake recipe as it’s one of the most delightful cakes ever. The texture is similar to Angel cake but it’s not dry, but very moist. 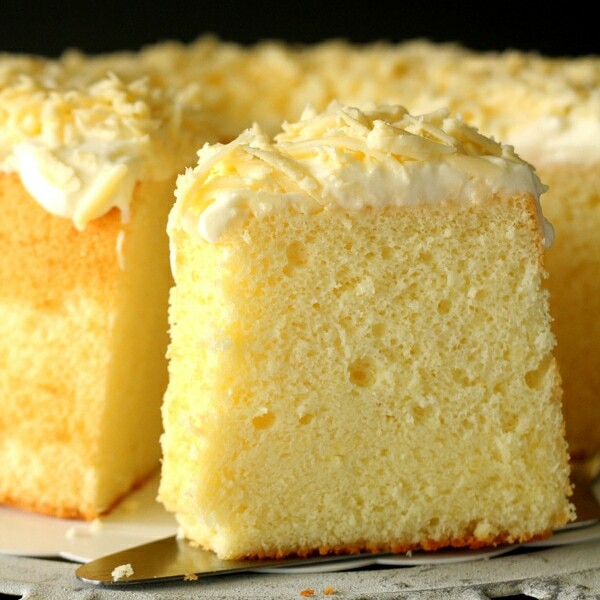 Parmesan chiffon cake – light and airy chiffon cake with a tint of Parmesan cheese, and topped with shredded Parmesan. Amazing recipe that you have to try. Hand whisk egg yolks and sugar till pale. Add in corn oil and milk, mix well. Add in flour and cheese, combine well, set aside. Beat egg whites over high speed till foamy. Slowly add in sugar, continue beat, add in corn flour, beat till soft peak form. Take 1/3 portion of egg white mixture and use hand whisk to mix with egg yolk mixture till combine. Fold the balance of egg white mixture into egg yolk mixture, combine well. Pour cake mixture into baking pan and bake at pre-heated oven at 160 degree C for 40 minutes. 1. Do not grease the tube pan, do not use non-stick baking pan. 2. Invert the cake together with the cake pan after removed from the oven and let cool completely. 3. You may omit the shredded cheddar cheese and whipped cream for decoration and change to whatever that suit your liking, ie, dusted icing sugar, fruit compote, caramel sauce etc. Curious why non stick baking tin cannot be used. …I only own non stick ones…. Do we just put on the whipped cream/buttercream then just sprinkle shredded cheddar cheese on? So buttercream/whipped cream from box only? no need to beat or anything? Whipped cream means whip up the “whipping cream” from the packet box with a little sugar till creamy or in stiff form. Buttercream means beat butter with icing sugar. Can we use other type of oil beside corn oil? Is corn flour the same as corn starch? Thank you! Yes I think so you can try different oil. Corn flour = cornstarch. Hi! Just love your blog! all your bakes look so yummylicious, every one of them! Hi bee, I’ve tried your pandan chiffon cake one time… and nailed it… somehow with this recipe… i have tried it for 4 times… and none of them rise properly…. And I have no idea where I did wrong… any suggestion? hi i just stumbled upon your website, and i love your recipes!! i know this post is kinda old, hopefully someone insightful is kind enough to answer my question :) can i replace the parmesan cheese with other cheese? I haven’t tried and not sure how it will turn out. i tried this cake 2 times axactly in the recipe…but it failed….any idea why? 2nd time i use, sunflower oil…also failed..
Hi, I want to ask, do you really only use corn flour for this recipe? no regular flour (wheat flour) at all? and why do you use the corn oil instead of other oil i.e vegetable oil? is it for healthy reason? thank you. Hi Fany, this recipe is contributed by my contributor and the recipe is from other source so I am not sure. what milk to be used. Can i use regular flour or cake flour instead of raising flour? I am not sure because I didn’t try. It’s best you follow the recipe as is. Tried this recipe. The result is not as good as other chiffon recipes. Parmesan makes the cake more tough, porous (big holes) and the skin is also not soft. To be honest, disappointing. Parmesan is good for cooking but not good for cakes and cookies. It’s different for sure. Thanks for trying! If your cake is flat, it means you didn’t beat the eye whites to soft peak. That’s the only reason chiffon cake failed.